First time director Ritesh Batra directs Irrfan Khan and new comer Nimrat Kaur in The Lunchbox. Lunchbox has been garnering rave reviews all around the festival circuits and flooring the critics across the board. It also created quite a furor when Lunchbox which was considered a frontrunner in the race to be India’s official entry to the Oscar was denied the chance and it was handed over to a little known Gujarati movie. Having seen the trailer and how impressed I was with the trailer I was about ready to join the voices of righteous indignation even before the movie began expecting to see a gem. The Lunchbox is the story of Saajan Fernandez (such an interesting name which is not explored in the movie) played by the multi-faceted Irrfan Khan who is nearing the end of his 35-year long service at a government office. It is the story of the ever suffering Ila played by new comer Nimrat Kaur who shuttles between getting her daughter ready to getting the dabba ready for the courier to pick it up to be delivered to her husband. The story is about how these two ordinary individuals through curious circumstances come to establish a relationship established over hand written notes exchanged via the titular Lunchbox. The story is also that of Shaikh played by the irrepressible Nawazuddin Siddiqui brought in to replace the retiring Fernandez and that of Mrs. Deshpande as voiced by the immediately recognizable Bharati Achrekar (Mrs. Radhika Wagle) the friendly neighborhood aunty who is always at hand to provide advice or a bottle of masala to spice up Ila’s marriage. There are a lot of good intentions and a well-meaning story and a lot of subtle nuances that Batra tries to infuse in this slow moving romance story but they were lost on me and my viewing company because of the insistence on staying away from the clichés that they ended up being indie-movie clichés of the worst sorts. Take for instance the communication between Ila and Mrs. Deshpande which happens without the audience even once seeing Mrs. Deshpande. It is in improbable that with the husband in the living room Ila would shout on top of her voice to communicate to MRs Deshpande who lives on a floor above hers and trying to muffle the sound by a running tap so that the husband doesn’t over hear the conversation. A more realistic and naturalistic portrayal would’ve been to have Mrs. Deshpande’s kitchen window be a few feet away from that of Ila’s so that the ladies could gossip and still be able to pass the jars of Masala across – a reality in the claustrophobic metropolis that is the financial capital of the country. The actors are all very competent and no one gives any single reason to complain about. The intensity is in Irrfan’s eyes and so is the vulnerability. Nimrat Kaur puts in a believable performance with understated presence that never once seems out of place in any scenario. Nawazuddin is a man with the midas touch – every role that he takes on has his distinguishable stamp, even here as the earnest Shaikh he does a wonderful job of being equal parts endearing and equal part annoying. I wish he was given a meatier role to flesh out his interactions with Irrfan. Problems I had with the movie have to do with the camera work and how the finished product appears. The trailer had a very clean fresh and crisp vibe, the visuals had a young energy to it even though they were filmed in government offices with cabinets burdened under thousands of files and tracking shots of the dabbawalas through Mumbai locals. The scenes in the movie look tired and washed out as if they are lacking in energy of any type. The colors of the city are washed out to be a monochromatic beige palette. The pacing of the movie is far too slow to allow for the audience to feel a sense of urgency of the relationship based on notes exchanged via a incorrectly addressed tiffin. And when the climax comes about it is so anti-climactic with the will they won’t they end that I wish I was watching Hrishikesh Mukherjee’s Mili where the fate of Jaya Bachchan is left to the audience to decide. Having seen this movie I don’t think I can justifiably be indignant or angry about it not being sent in as India’s official selection to the Oscars for foreign Language feature film category. I am angrier that this movie is getting so much more mileage than Ship of Theseus which was a far better movie than this one and the one movie which I’d be proud to have represent India at the Academy Awards. If you want to watch what the hype is about, go give this movie a watch – there is nothing particularly bad about this movie and it could even be mildly entertaining if you are luckier than I was when it came to a juvenile audience. Ron Howard directs Chris Hemsworth and Daniel Bruhl in the Formula 1 Drama Rush based on the true story of the rivalry between Niki Lauda and James Hunt. Sports themed movies are fertile ground for telling a compelling story and captivating the audience attention by getting them to cheer for the underdog against insurmountable odds and then letting them bask in the shared glory. Rush does not stick to this formula of the underdog versus the rest of the world. Rush is about two protagonists who have a very different take on the sport and in their own way are great at what they do. While acknowledging each other as their nemesis and arch rivals they do take turn to acknowledge the rival as being their driving force in wanting to do better. Armed with a story steeps in the annals of the Formula one legends Peter Morgan pens a taut screenplay and scenes come alive and the back and forth between the two leads seems believable and engrossing at the same time as there are no grand dialogues just awkward sentences between a cocky Brit and a methodical Austrian as they try to one up the other both on the track and off it. Anthony Dod Mantle’s work behind the camera is exceptional in every single way possible. The side track shots of the cars zooming past are adrenalines pumping as well as the scenes at the Japanese grand prix are heart stopping with the use of slow-mo. Hans Zimmer provides another excellent score for a Ron Howard movie and in my opinion tops his Angels and Demons’ score which till date remains a personal favorite of mine. Of the lead it is very hard to pick who does a better job as both the leads shoulder the entire responsibility of the movie on their very able shoulders. While Chris Hemsworth is good looking charismatic and cocky, Daniel Bruhl is awkward, methodical and measured in his approach. Hemsworth shines in the scenes he has a humorous line or two to deliver but he does equally as well with the scenes which require in him display his vulnerable side. Bruhl is enigmatic in his action speaks louder than words approach and shows he has as funny side as well. Olivia Wilde is mostly wasted by the other female lead Alexandra Maira Lara as Marlene Lauda is understatedly brilliant in her stoic and poignant portrayal of the woman who stood by Lauda’s side when he was recovering in the hospital. The movie is not only for the formula one enthusiast as I am the farthest thing possible from a F1 enthusiast. 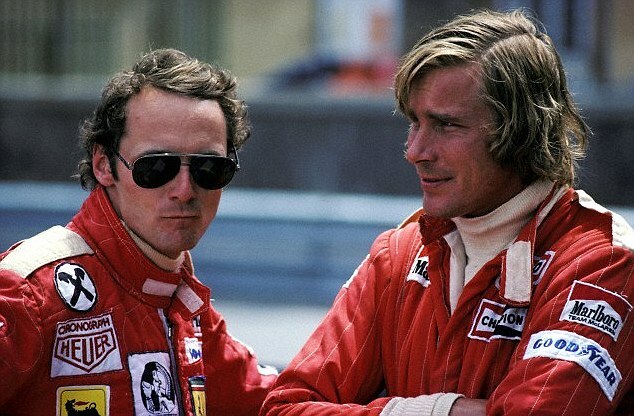 It is an entertaining and moving feature on two of the sports biggest legends and a rivalry that is mutually symbiotic in that it almost kills Lauda while it still manages to give him enough drive to want to come back and reclaim what is rightfully his. Ron Howard has created a gripping drama which happens to be based on a great rivalry in one of the worlds most popular sports. The acting is top notch the visuals are rich and textured and the music is amazing – I cannot recommend this movie enough – go watch it in the biggest screen possible as this is some heart racing and pulse quickening drama that is entertaining to the boot! Don’t miss this movie.